A Streetcat Named Bob is a movie which attempts to precariously balance a sober look at the chaotic misery found in the lives of drug addicts and, simultaneously, provide the audience with a feel-good sing-along family romp starring an absurdly handsome and charming feline lead. That Roger Spottiswoode even attempts such a feat is to be lauded - trying to engage family audiences with such heavy themes is truly admirable. Unfortunately, however, not everything in A Streetcat Named Bob falls into place; the result is in an amiable, albeit flawed, feature which might inspire a few tears among animal lovers if not, necessarily, many repeat views. This true-life tale is the story of James Bowen (Luke Treadaway) - a homeless drug addict who struggles with his recovery. Throughout the day Bowen busks, performing his own songs (some might say pretentiously) in Covent Garden and hoping to raise enough money for something to eat. His support worker sees something in him to offer our protagonist a home of his own in which to recover - perhaps its the fact that he represents the "creative/troubled mind" trope which encourages his support worker to allocate him a place above others? Regardless, the moments after he is introduced to his new dwellings which inspire one of the films greatest moments - a brief euphoria inspired by having running water cuts away to a few hours later. Boredom, and a lack of things to do, seem to have consumed Bowen. In its own small way, this may perhaps be the most profound moment in the entirety of Spottiswoode's film. Bowen's quiet new life is quickly interrupted - a clatter stirs him from his comfort. Expecting a burglar, our hero is quietly thrilled when he sees a much more welcome guest - a stray, ginger cat who clearly seeks companionship as much as James himself. This is the moment a very special bond begins - with something to truly live for, with the responsibility of another soul to look after, can our protagonist find purpose, incentive and desire to turn his life around? 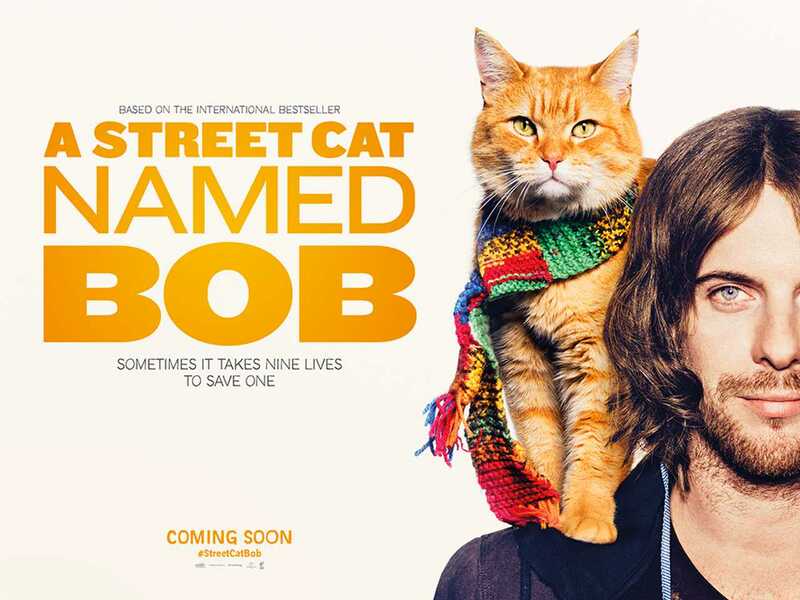 For animal lovers, the single best aspect of A Streetcat Named Bob will be the titular character himself (who, interestingly enough, is portrayed by his own real-life counterpart). His wide-eyed face and gentle demeanor is a delight to observe; as the drama goes on around him, Bob languidly watches and, in the way he is framed, often reflects the same curiosity and wonder as Jacob Tremblay channels in Room. And, indeed, drama is in no small supply here - anyone who has ever known or met a drug addict, recovering or active, is aware of the constant chaos which follows them. The flaws in the feature, however, cannot be entirely discounted. Spottiswoode has a jarring propensity to cut to a bizarre cat P.O.V. shot at regular intervals - as we're introduced to a quirky "Level 4 Vegan" neighbour and love interest, the effect feels like the direction has been hijacked by a particularly unfunny episode of Peep Show. The aforementioned romance may stretch credibility somewhat and, it must be said, despite the big issues tackled here, this is a movie which often feels slight. Ultimately, none of this will matter to much of the audience - there is, after all, an impossibly perfect cat for us to gaze at throughout.